Why? Motor oil works best when uncontaminated. Continuous friction creates unwanted tiny metal particles; these tiny metal particles are measured in microns (one millionth of a meter). All the contaminants cannot be removed by the oil filter because an oil filter can only remove particles larger than 35 microns - Dimple® products remove the rest. If not removed, these contaminants are circulated millions of times between each oil change, wearing down the metal until the engine is worn out. What some may not realize is that there is still residue left in the engine, even after an oil change, so new oil in the engine does not mean uncontaminated oil. 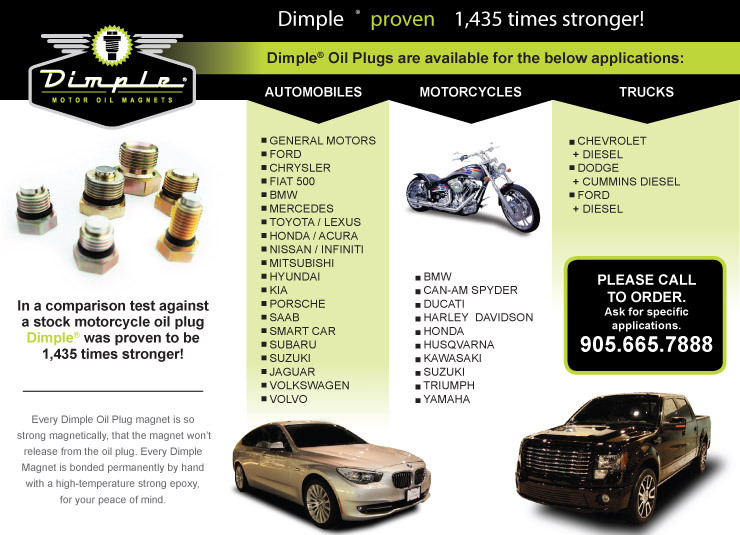 Dimple® products provide a solution that works, saving you money and extending the life of your vehicle. How? Dimple® products use extreme magnetism to rip the metal particles out of your oil and keep them out. All magnets are not created equal - Dimple® magnets are made under contract to ensure that they continue to be the strongest high-temperature grade neodymium magnets in the world. These high-temperature neodymium magnets do not lose magnetism like regular neodymium magnets do at only 175 degrees F. Dimple® magnets are rated at over 300F. Nickel Fusion technology. This technology is a superior, high-end protective barrier that outlasts yellow chromates by five times. Dimple® magnets work well in all hot engine environments. The nature of Dimple®-specified magnets means that you can expect them to last far beyond the lifespan of your vehicle. If you would like more information, read the results of an independent laboratory test comparison between a stock magnetic plug and a Dimple® magnetic plug. View our brochure. For more information on the product, please contact us.